By Jake Rocheleau in Toolkit. Updated on June 22, 2017 . GitHub is a powerful resource for developers to connect and share work. But, it’s not the best organizational tool for saving and sorting through libraries. With Larder, you can bookmark all your favorite libraries, frameworks, plugins, and tools in one place. You can organize by languages and by tags to make sorting easier. Plus, it comes with a free plan, so developers can use this for life without ever paying a dime. If you have a GitHub account connect directly to Larder to share your stars and personal bookmarks. This is perhaps the easiest way to sync everything together into one place. Larder will automatically refresh your GitHub stars every 24 hours to pull the latest changes each day. 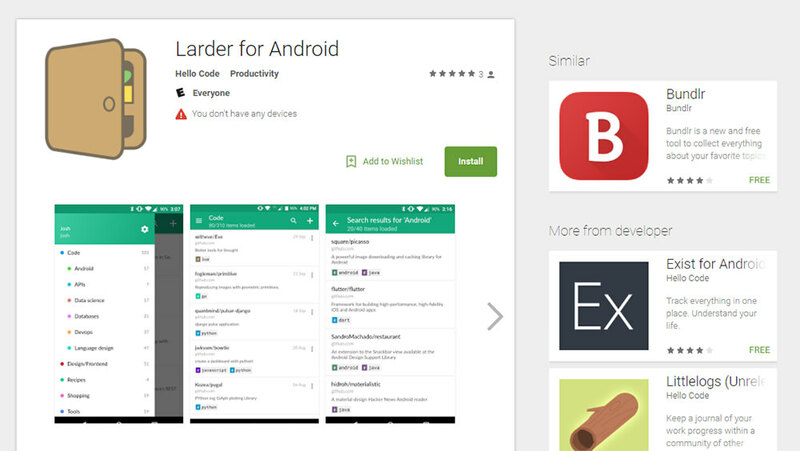 If you’re an Android user you can also the Larder app completely free from the Google Play store. The team is also working on an iOS app which should be out at some point in the near future. Don’t look at Larder as a code-only resource. It’s also fantastic for saving tutorials, opinion pieces, or comment threads on Reddit that you’ll want to read through again. If you’re a fervent developer you should give Larder a try. It’s free to join and it provides the best bookmarking service for coding anywhere on the net. Not to mention, they also have a free API so developers can connect to the site and build their own related apps. GitHub users will find the most value from Larder’s sync feature. It pulls all your stars and bookmarks them automatically, plus it pulls weekly updates on those starred repos. This way you can stay on top of all your favorite libraries & frameworks with updates cataloged in one place. Very handy!